Spring scene of the open space known as Hatsune no Baba, located in downtown Edo not far from Asakusa Gate. This space was originally a horse-riding grounds (baba) for practice by the shogun's retainers, the oldest of several such in Edo (see Pl. 115 for another). 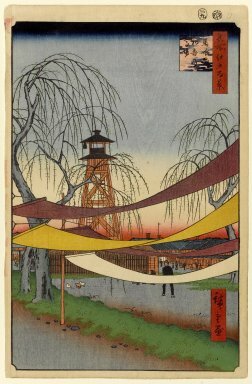 By Hiroshige's time, however, it no longer played a role in the defense of Edo but was now retained as an idle space in a crowded part of the city, with willows planted around its perimeter. This print provides evidence that dyers from Kon ya-cho, several blocks to the west (see Pl. 75) had taken to using the space for drying their cloth, three blots of which are strung between posts in the foreground. In the background to the left is a watchtower for fires. The buildings below are largely devoted to lodgings for visitors to Edo, maintaining the long-established function of this site at a point of entry and departure along the Oshu highway for travelers from the north. The open area, besides being used for drying newly dyed cloth, was also used at night by nearby match makers for testing the quality of their sulphur. Difficult to see in reproduction is the textured cloth pattern on the white strip of cloth, created by a technique known as nunome-zuri, "fabric-printing." This technique was used frequently in the first paintings of the "One Hundred Famous Views of Edo," most commonly in the title cartouches, but also as here when actual fabric was depicted. It was achieved by pressing a piece of silk into the moistened paper, leaving the pattern of the weave delicately embossed on the surface.